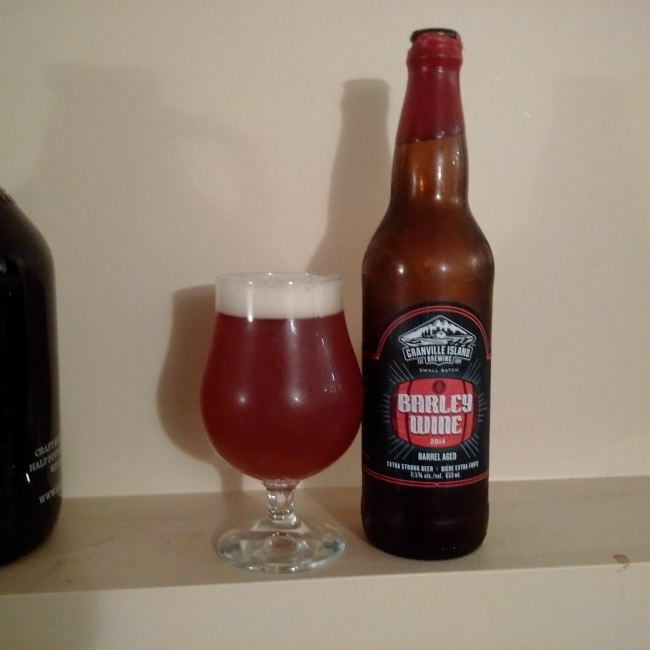 From Granville Island Brewing located in Vancouver BC comes their Winter seasonal “Barley Wine 2014” a beer that is barrel aged. Like all Bombers (650ml bottles) produced by Granville Island Brewing this beer is actually brewed on Granville Island not brewed elsewhere. This years batch pours a deep orange / copper colour with an off white head. The aroma consists of earthy, caramel, fruits, vanilla and floral hops. The flavour is of caramel, vanilla, sweetness, bourbon, oak, citrus, tropical fruit, earty, bitterness, pine, resin and a dry finish. The alcohol content comes in at 11.5% with an IBU of 60. This is a very good beer although it is really more of an Imperial IPA and not a Barleywine. Vern the brewmaster decided he wanted to try and make the beer different this year and this is how it came to be. Commercial Desciption: The typical Barley Wine may find its origins in English Ale, but there’s nothing typical about this special brew. You can even cellar and enjoy it for up to five years. But if that’s too long to wait, you can always try it tonight. Food pairing as per brewery: The strength and intense flavours are a match for strong cheeses like Stilton. This entry was posted in Barleywine Ale, Barrel Aged, Imperial and tagged beer, bitter, bitterness, bourbon, caramel, citrus, craft beer, dry, dry finish, granville island, granville island brewing, oak, oaky, pine, resin, sweet, sweetness, tropical friut, tropical fruit, tropical fruits, vanilla.